At SQN, it is our mission to keep up-to-date with evolving trends, breaking deals and missteps in the world of sponsorship. While our friends and relatives are all cheering on their favourite sports personalities, we’re busy working out why a particular company has invested in perimeter advertising, what ROI a shirt sponsor is deriving and why, frustratingly, so many brands are under-exploiting their partnership benefits. As we launch ourselves headfirst into another week of the New Year, we’ve picked out three sports sponsorships that caught our eye over the weekend. There has never been a better time to be associated with English netball. The sport is enjoying a huge ascendancy in the country following the team’s Commonwealth Games success last April – and health insurance provider Vitality is at the heart of its growth. Watching the Quad Series over the weekend, the brand’s activation was in full effect. No strangers to sport sponsorship, Vitality originally signed a long-term deal with England Netball in 2015, and extended it in October last year, riding a wave of positive association. 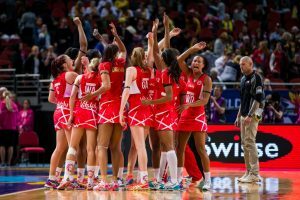 It has now become the title partner of the Vitality Netball International Series, the Vitality Netball Superleague, and the 2019 Vitality Netball World Cup. All this, and the team also takes to the court as the newly named Vitality Roses. Throw in some bright pink on-court branding, courtside LED boards, and post-match interview backdrop branding and you’ve got yourself a very proud and loud partner! Loyalty is paying off for Vitality, but it is their enthusiasm and passion that really shines through ahead of a big summer for Netball in England. The 2019 Australian Open may be remembered for Andy Murray’s valiant opening round defeat and talks of retirement, and more recently for Roger Federer’s exit, but there are also big numbers on the sponsorship side. Eagle-eyed observers will have noticed that Court 2 has been renamed the 1573 Arena. Quiz fans will have enjoyed working out its meaning but it will be fans of Chinese distilling who win top marks. 1573 was the year back to which the Chinese Baijiu distillery “Luzhou Laojiao” dates. Of course it is, we hear you cry. The distillery became one of the tournament’s biggest sponsorship deals in October last year, signing up as an associate sponsor for the next five years. The sight of a giant 1573 logo behind Roger Federer’s head on the Rod Laver Arena was somewhat eye-catching, mainly because we have become accustomed to more familiar names. Brand loyalty is a large part of the Australian Open’s success with Kia, Rolex and ANZ being prime examples. Being an Asia/Pacific tournament, we shouldn’t be surprised by a Chinese brand becoming a key partner, but beyond this it may be a reflection of a Chinese brand breakout that could well play a key role in the 2019 sponsorship landscape. When extending its title sponsorship of the Masters in the middle of 2016, Dafabet spoke of wanting to become synonymous with snooker’s most prestigious invitation tournament. It would be fair to say that the company is achieving its aim as the sponsorship was put firmly in the spotlight as Judd trumped Ronnie at the weekend. Having originally signed up as title sponsor in 2014, the privately owned online gambling company, based in the Philippines, is now six years into a partnership that runs through to 2020. The betting firm is doing a great job with its social activation, with regular and relevant tweets about the tournament. Clever use of snooker legend Jimmy White as a brand ambassador adds value to fans around the world, who gain invaluable insight. When taking a closer look at Dafabet’s sponsorship portfolio it is clear to see that outside of the Masters, it is very football-heavy (Celtic, Leicester, Fulham and the Welsh FA). The Philippines-based company bridged this gap beautifully via a social video of Jimmy White visiting Celtic’s training ground to take on club manager Brendan Rodgers in a game of pool. (Why not snooker, though, we wonder?). Cross-platform activation can really enhance sponsorship awareness, offering a holistic use of assets and bringing fans from sport across to another. Dafabet has successfully used its sponsorships to lead its social content rather using them as an afterthought. Kudos to them, or should that be cue-dos?